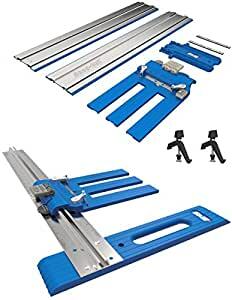 The Kreg Accu-Cut simplifies making straight, accurate, splinter-free cuts in plywood, MDF, and other large sheets by guiding your circular saw along an aluminum track. The Kreg Rip-Cut turns your circular saw into a precision edge-guided cutting tool that makes straight, accurate, repeatable cuts in plywood, MDF, and other large sheets. With the Rip-Cut, you can cut with the confidence you want and the precision you need. The Rip-CutTM easily makes straight, accurate, repeatable cuts in plywood, MDF, and other large sheetsâwithout measuring, marking, or having to keep the saw on the cut line. The Rip-CutTM does this with a long edge guide that follows the straight edge of the sheet you are cutting. So, all you have to do is lock the saw in at the measurement you wantâup to 24″âusing the built-in measuring scale, and then make your cut. The Rip-Cut is very easy to use. Simply mount your saw to the universal sledâit accepts most left-blade or right-blade sawsâand then slide the sled onto the aluminum rail. After a simple one-time calibration, you can lock in your cut width (from 1″ to 24″) using the measuring scale and precision cursor. Then, just hold the edge guide against the edge of your sheet as you guide the saw. Youâll get straight, accurate, repeatable cuts easily every time. The two clamps are great for cutting Melamine and other slick surfaces.